ISLTANBUL, Oct 21 (APP):Prime Minister Shahid Khaqan Abbasi and President of Guinea Alpha Conde Saturday discussed ways and means to further strengthen their bilateral relations, as they met here in this historic Turkish city on the sidelines of 9th D-8 Summit. The two leaders discussed the prospects of enhanced bilateral cooperation in diverse areas including defence, agriculture, education, railways, banking and construction. The Prime Minister said Pakistan’s vision for Africa was to develop strong, close cooperative relations by enhancing trade, investment and defense cooperation and establishing joint ventures and public-private partnerships. About Pak-Guinea cooperation, Prime Minister Abbasi offered Pakistan’s expertise to Guinea in textiles, leather, infrastructure development, information technology as well as to share experience of SMEs with Guinea. resources in an efficient manner. Both leaders were unanimous in the views and endorsed the Turkish President’s proposal of expanding the D-8 Organization for inclusion of other countries. Discussing the global challenge of terrorism, the Prime Minister said Pakistan has achieved significant successes to eliminate this menace with national resolve. The President of Guinea said terrorism was a common enemy and needed to be tackled effectively. He expressed Guinea’s desire to have strong bilateral relations with Pakistan in every field and said Guinea was open for Pakistani investors. 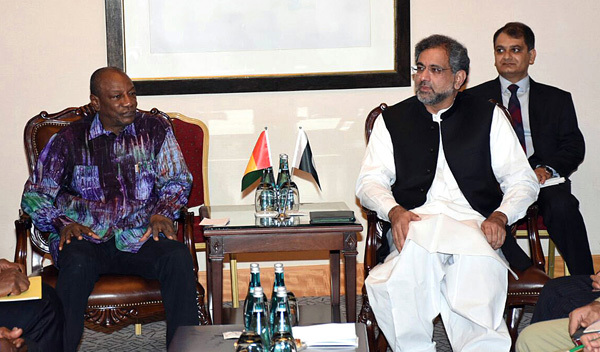 The President of Guinea invited Prime Minister Abbasi to visit Guinea at the earliest, which was accepted by the Prime Minister who reciprocated by extending invitation to President Conde to visit Pakistan.